Quacking for all duck lovers! 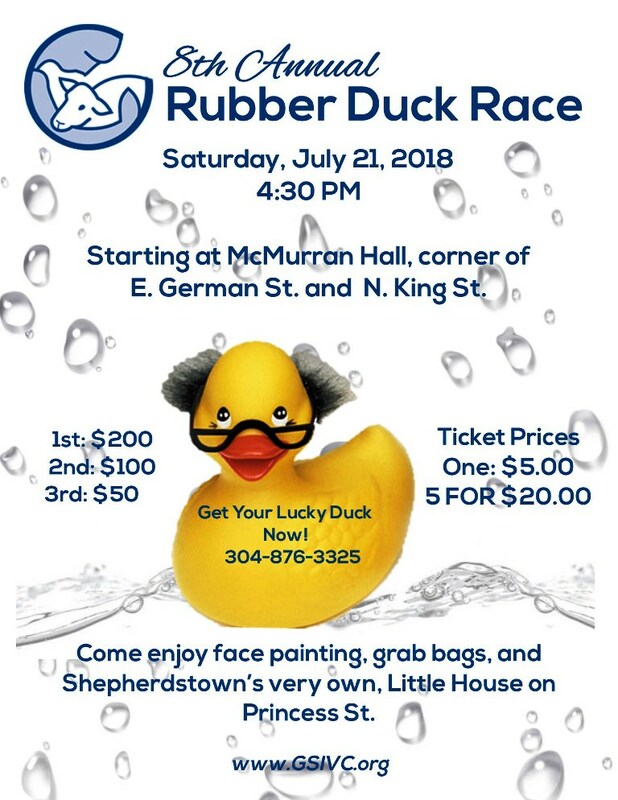 Join us for the Annual Rubber Duck Race held at the Town Run on July 21, 2018. The ducks begin their journey down the Town Run at 4:30 p.m. and continue their journey to the Little House. Come be a part of festivities including face painting, playing in the Little House at Shepherd University, and grab bags, anytime after 12:00 p.m. on the day of the event. Put your inner artist to work by volunteering to face paint. To purchase tickets, call 304-876-3325. Individual tickets representing one duck are $5 each and a family of ducks are $20. Proceeds benefit the free services to seniors and those living with disabilities provided by Good Shepherd volunteers. Prizes are given for the 1st, 2nd, 3rd, and last place duck crossing the finish line during the event. One need not be present to win.